Click Plastics are one of the leading suppliers of Building plastics and PVC building products. Free Delivery over £70 and Trade accounts welcome. 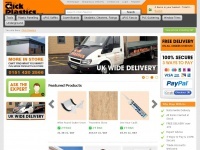 The web server used by Clickplastics.co.uk is run by Fasthosts Internet Limited - UK's largest web host and is located in Gloucester, Great Britain. This web server runs 7 other websites, their language is mostly english. The Clickplastics.co.uk websites were developed using the programming language ASP.NET and served by a Microsoft-IIS server. For managing the data of the webpages the CMS DotNetNuke is used. XHTML 1.0 Transitional is used as markup language on the webpages. To analyze the visitors, the websites uses the analysis software Google Analytics. Indexing the data of the website and following hyperlinks on it is explicitly allowed by robot information.